For months we have been excited to share one of our first local projects for one of the most kindhearted people we know, the widely accomplished Deborah Briggs. A world-renowned expert on rabies, Debbie is also a crazy talented local weaver here in Paris, extracting from her looms and home studio some of the most elegant textiles we’ve ever seen. 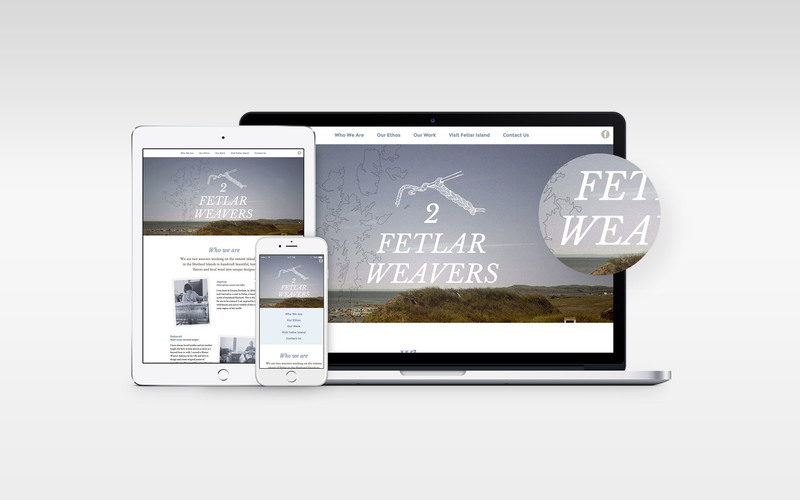 We were proud to be involved in creating the first website dedicated to her craft, 2 Fetlar Weavers. True to Debbie’s character, 2 Fetlar Weavers isn’t just about her. The site tells the story of two weavers, Debbie and her friend Joanne. Having grown up in Paris and fulfilling a career running a rabies lab and international non-profit, it seems unlikely that Debbie would have ever met Joanne, a sheep farmer living on the remote Fetlar Island in northern Scotland. 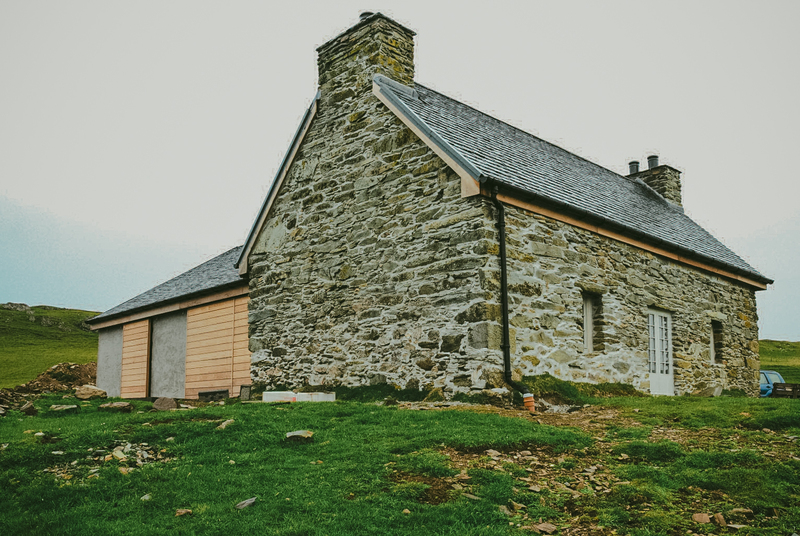 But Debbie ended up purchasing a cottage on Fetlar to take advantage of the island’s milder (and sometimes wilder) winters. One winter Debbie decided to offer a spinning class to some of the local women, and Joanne quickly stood out as a kindred spirit. Fast forward to today, Debbie commissioned this site to serve an immediate need; both Debbie and Joanne needed a website to qualify for the annual Shetland Island Craft Trail, so they figured they would share one. Debbie also wanted in some small way to contribute to the economy of the island by encouraging tourists to visit Fetlar and purchase local handmade goods. We were honoured to help design a legitimate online home for Debbie and Joanne’s story. 2 Fetlar Weavers had little in the way of content other than their textiles, but they did have a solid ethos: handmade, local, responsible, simple. They had no need for gadgets and gizmos on their site; they didn’t need a fancy contact form, they didn’t intend to sell product through the site or even to keep the site updated, and they didn’t need much more than a way for others to get in touch. We found this restraint refreshing. Too often clients insist on functionality they never end up using (embedded calendars that rarely have active content is a good example of this). We made it easy to enhance later should they decide to add features like a more interactive gallery, a shopping cart, additional pages about their history or process, or even lovely animated touches we so love. All in good time, and only in so much as they prove useful to Debbie and Joanne. Simple content doesn’t necessarily mean a simple build. Because of the range of devices and screen sizes on modern devices, building a site that works equally as well on mobile as it does on desktop means approaching the design from a variety of resolutions and browsers, regardless of how low-tech the design may be. We needed to ensure the site told its story equally well no matter the device. The technical part of designing and building websites is best when it is invisible and seamless, so it was most important that the initial experience of the site site is predominantly tactile and handmade, reflecting those qualities that represent Debbie’s and Joanne’s work. Elements such as the drypoint illustrations, woven textures, serif font headlines, soft colour palette and photography all needed to work together to create the same atmospheric effect. The functionality of the site needed to do its job and stay out of the way – which we think we accomplished. Working with existing assets is usually a challenge because web portfolio images have specific needs. They must be high resolution and crisp, have consistent colour so they feel like a set, and they certainly benefit from a focused point of view. It’s difficult for clients to walk in with that kind of photography unless they have specifically commissioned it. But, we work with what we have or create those assets ourselves when possible. When it’s not possible – like here, where Debbie’s creations were still on the loom and Joanne’s work was mostly still in Fetlar – we take care to adjust existing images to meet high quality criteria as best as we can. This is often a multi-step process including colour correction, composition adjustment, tweaking of high and low light levels, and final layering to ensure the image feels like it belongs to the page rather than having been simply slapped on. With these particular bio shots, you can see how we worked to make use of originally low-resolution, cluttered assets. The desaturation of colour helps both bio photos feel as if they were taken on the same day. We also photoshopped out some of the distracting background objects and carefully rearranged the composition to better focus each photo on their portrait subject. One of the big wins in this project was sourcing Creative Commons black and white drawings of our subject matter (who would have guessed we could find a shearing sheep illustration!). Without time/budget to create our own assets, this was a true stroke of good fortune. The drawings became an important element to emphasize the handmade qualities of Debbie’s and Joanne’s creations. As such, we wanted to be sure they rendered well in the final product. Initially we thought the images would work best if we vectorized the drawings, which means they would scale across screen sizes without losing quality and becoming pixelated or blurry. Usually vector graphics, exported as svgs, are incredibly crisp – which makes a big difference when viewing a site on a retina display. But here, we were losing some of the softer lines that made the originals so appealing. Ultimately we reverted to high resolution svgs which in the end still looked great and were not much larger in image weight. It’s these kinds of details most people probably wouldn’t notice but that drive us crazy until we make them right. One of Debbie’s final requests was to include a small sampling of information about Fetlar for potential visitors. The Island of Fetlar is tiny with a population of approximately 65 (not 6500 or 65,000 – 65 individuals), however it is well-known for its flora and fauna and it regularly attracts photographers and tourists to capture its natural beauty. So we rustled up some other respectable links and literally put Fetlar on the map. Although we’d love to do more to bring this peripheral content to life, we did what we could for Phase 1. 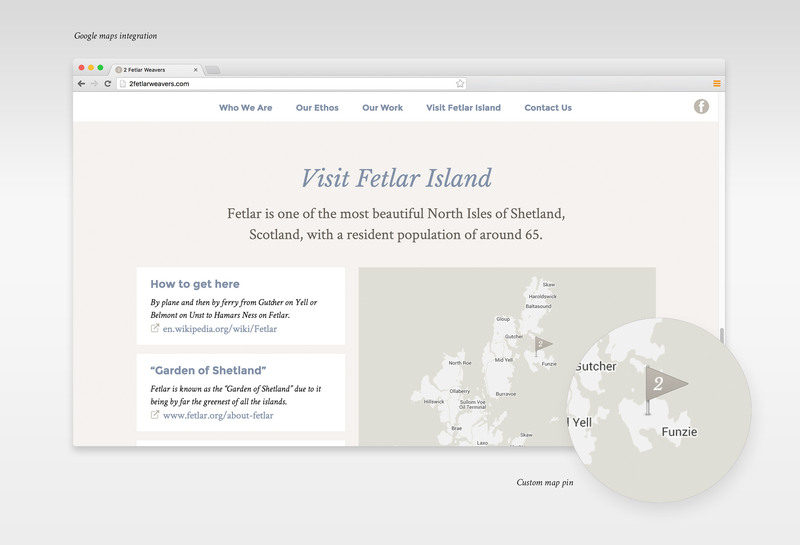 We customized the Google Map to match our colour scheme, dropped in a custom pin and made the map frame default to where Fetlar sits in the Shetland Islands. This kind of Google Maps customization is something Mark has been doing for years so it was nice to be able to apply it quite easily and usefully in this instance. We are proud of this small, simple site and grateful to Debbie for letting us help her bring it to life. We enjoyed the process – learning the story of two genuine people who get to practice their craft in a way that is meaningful to them, and then using our skills to help propel them forward in their goals. We look forward to working with other artists and locals to do the same. Have a project in mind? Check out our ‘Work With Us’ page to see what we can help you with. We’d love to meet for a coffee or have you over to our studio. Send us a quick email to let us know what you’re thinkin’.